Rabbi Yossi was born and raised in a family of Chabad emissaries in the vibrant and friendly Jewish community of Melbourne, Australia. Growing up in the warm and giving environment of Chabad outreach profoundly affected his life goals and his vision for the future. He attended Yeshiva College (Melbourne) for his Elementary & High School education, and later continued his studies at the Educational Institute Oholei Torah in Brooklyn, NY. In 2001, he was chosen as a Yeshiva exchange student and sent for two years to Toronto, Canada. Upon completion of his studies in 2004, he received his Rabbinic Ordination from the Central Lubavitcher Yeshiva in New York. Ever the trail-blazer, Rabbi Yossi, was the founding director of the highly successful Student Outreach Organization of the Yeshiva Lubavitch in Toronto. More recently he was instrumental in the founding and original management of the nationally acclaimed JNet Chavrusa Program. Before moving to Folsom, Rabbi Yossi visited many cities in the U.S., Canada, and Europe to provide educational events and holiday programs benefiting small outlying Jewish communities. Rabbi Yossi is a passionate speaker on many Jewish subjects, a favorite topic is relating the timeless teachings of Judaism to today's modern-life complexities. His classes are sought out and well attended and his popular Ten Minutes of Torah on Tuesdays is viewed by hundreds of people each week. You can connect with Rabbi Yossi on Facebook at www.facebook.com/yossigrossbaum, or call him at 916 608 9811 x 101 or email rabbi@jewishfolsom.org. Goldie Grossbaum was born and raised in Brooklyn, NY where she attended Beth Rivkah – the flagship Lubavitch girls’ school. Following high school, she spent two years attending Beth Rivkah Teachers Seminary and received her Diploma of Judaic Studies. Goldie has extensive experience in the areas of children’s programming and education. Throughout her high school years, she worked as a successful counselor and head counselor in California, Connecticut and Ohio. Following her graduation, concurrent with her teaching degree and for five years following, Goldie taught multiple grades in both elementary and high school. 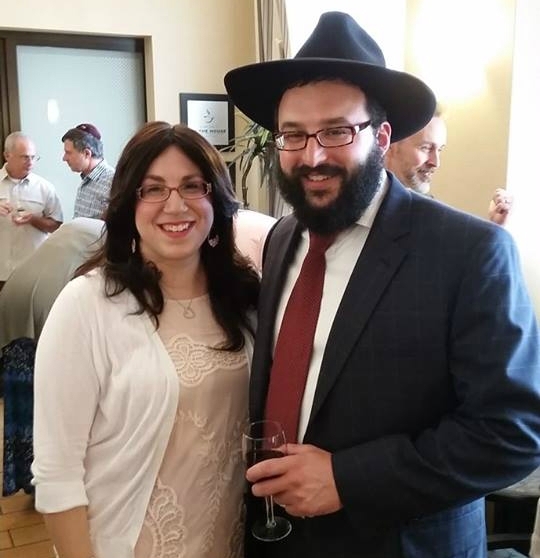 She utilizes these skills effectively in her capacity as the director or the Chabad Hebrew School and as the Program Director for Chabad Jewish Community Center. Goldie is known for her insightful and practical advice, her parenting advice is well regarded and sought out by local and out of town parents. Goldie provides relationship coaching for both singles and those in committed relationships. She shares her musings and insights on motherhood, kids and life in general on her blog: www.littleyellownotepad.com. Rabbi and Mrs. Grossbaum are the proud parents of Mendel, Zeesy, Levi, Zalman, Shmuly, Gershon, Nosson and Sruli.